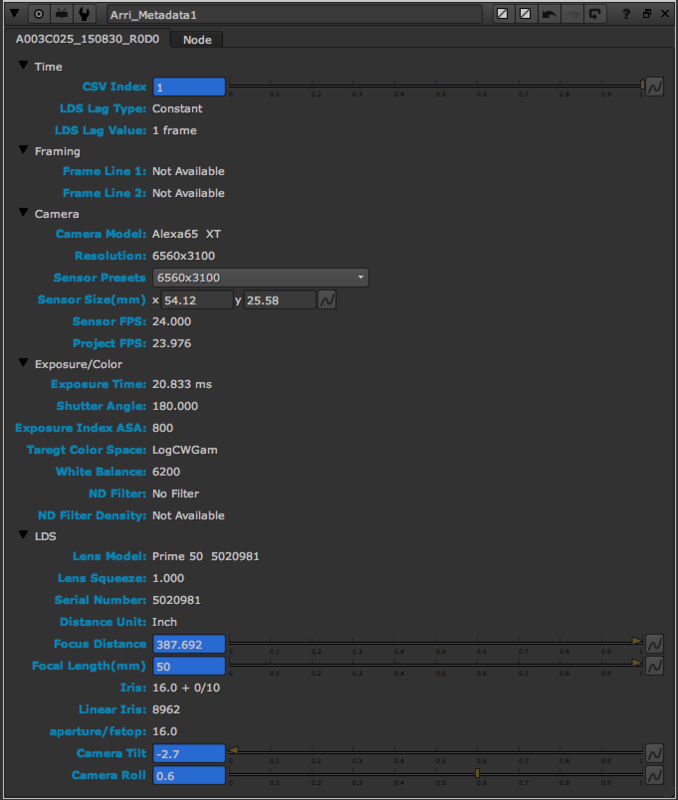 Arri Metadata extract for Nuke is a tool I have been working on lately to make full use of the metadata available in the Alexa files right inside Nuke. This tool can be very beneficial to Matchmovers - LookDev/Lighting - Compositing. It extracts most of the data you need like Focal Length, Focus Distance, Fstop etc..
You can synch a full take on disk with a Read node inside Nuke and extract the static data as well as animated just for the duration of the plate. - If a read node is selected then it will attempt to extract locally from the Read's metadata. - If nothing is selected then a prompt will pop up to let you choose a file on disk to extract the data from. (Recommended mode for full metadata). Thanks Mohamed, just what I needed!! Great timesaver!! Thanks. Happy I could help. So i understand you correctly. You launched the script without selecting a Read node to access a file on disk, and you have "Synch with Read Node" checked and specified "Read1" as the node to synch with? What type of file are you trying to access? ARI...MOV? The error your getting means that the field "CameraClipName " in the metadata is empty which is unusual for an Arri file. Can you share the CSV generated? Hi Mohamed, thanks for the reply. I was extracting the CSV from a .mov using the Arri Meta Extract GUI. From my understanding, in the CSV it was separating items with tabs instead of commas, which is what the code above fixed. So the tool now works great if I manually create a CSV beforehand, but would be great if I could create it straight from your tool. So it looks like the tool is looking for the CSV, but never creating one? Thanks for the help. You are right. This tool works only on comma separated values generated by Arri's command-line tool and not the default TAB by the GUI. The py file should be in the downloaded folder along with the command-line tools and other py files. Maybe that's why you couldn't generate a csv because the tool cant find the command-line tool. Also i just uploaded V1.1 with some bug fixes so try that out and make sure its installed correctly as described above and tell me how it goes. Thanks for pointing that out, my bad for not moving the whole folder. I'm still however getting the same error with now correct installation and using v1.1. Anything else I might be doing wrong? First off please download v1.2 as for some reason the osx arri tool did not have the correct permissions. Another way is to launch Terminal and type chmod 755 then press space and then drag the ARRIMetaExtract _CMD_3.4.5.50_o sx file and press enter. I think the problem is you have some other files on your desktop with the arri mov file. Files like exr's for instance. So the tool is trying to extract metadata from them and fails. Or if you dont have other image files in that folder then what happened was the first time it wasn't installed correctly and the second the tool had no permissions. So for now please just put your quicktime in a sub-folder and hopefully it will work. I'm working on the code right now to avoid this in the next version. Sorry for the late reply, but v1.2 works great now! I have the quicktime in a subfolder and it created the CSV and displayed everything correctly. Thanks so much, this tool's a great help. I'll keep an eye out for future versions. Could I just ask, how do you open .MXF files? I can't open them in Nuke for some reason.. Still as of Nuke 11, you can not. This can just extract the metadata from the mxf on disk. Hi , i have an issue with the gizmo , I have a mov with all the metadata that i need . I checked the csv from arri meta extractor and it has tilt and roll and i cannot access them from the gizmo . I would be happy if i knew how to import from arri's csv but i am not a python user for now . Just letting you know if there is something that you could consider for a future release . Sorry for the late reply. I downloaded your csv file and there something wrong with its format. Maybe you opened it with Excel or something and saved. But I will upload tomorrow v1.3 which will allow you to import csv's directly like you wanted. My advice is to regenerate the csv again and without opening it, try loading it with the new version. no problem , thanks for replying . It is not something that i personally did , it's how the arri's extractor saved it , regarding the csv. So we understood that it's a new way of saving . maybe an update of firmware on the lds. We managed to make it work by adding the new Arri's extractor and some magic from a friend that understood your gizmo . Ill check their new extractor now and update it. Thanks for the heads up. I updated the tool to work with tab formatted csv's instead of comma which I think was your issue and its also what arri uses by default. Also you can now just extract from a csv on disk if its pre-made. Great tool for Arri Alexa footage, thanks a lot. Do you think you could adjust it to work with R3D as well?